Here in Nashville we are always looking for snow, but never seem to get any. When they call for it, we all run to the store and purchase food just in case we can't make it out of the house for weeks. Luckly I had already gone to the store, but I still needed a few things (coffee). On Wednesday Owen had to get another set of tubes put in. I took off work from Wed.-Friday to stay home and take care of him. We had to arrive to the surgery center at 6:45 to get prepared for the 7:45 surgery. I was a little worried that Owen wasnt allowed to eat/drink past midnight. Needless to say, he never asked for juice when he woke up. We took Owen in his jammies b/c 1. they said to and 2. I knew he would be really tired once they were finished. They called us back and started to process to prepare Owen for surgery. 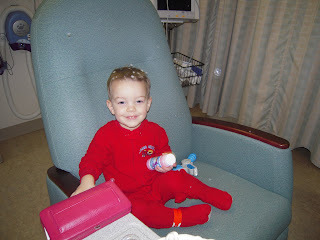 The anesthesiologist was wonderful and knew exactly what to do with a 2.5 year old child...BLOW BUBBLES!!! He had these bubbles that wouldnt pop and Owen was amazed. Here is a picture of him with these bubbles in his hair. They never truly went away and looked like he has lent in his hair. It drove me crazy, but Owen loved it! He was not wanting to head back with the doctors, but they put him in a wagon and took him off. It only took about 15 minutes to put the tubes in and he would be in little/no pain afterwards. The doctor came in and told us that Owen STILL had an ear infection in his left ear and we definately needed to be there. Owen got sick on the way home and we were expecting that. Last time he has this done he got sick so I knew to bring a towel with me so there wouldnt be a mess in the car. We got home and he slept for 2 hours, woke up, and was like nothing happened.